Affordable housing is a big issue in this year's mayoral campaigns in Minneapolis and St. Paul. The candidates say they need to ensure low income people can continue to live in the state's two largest cities. But in Minneapolis, a new report says more affordable housing units are being lost than are being built. The report says thousands of apartments are being converted into condominiums, and the people who had been living in the apartments can't afford to buy the condos. Minneapolis, Minn. — Evelyn Belmer lived in her two-bedroom apartment in Minneapolis' Uptown neighborhood for 21 years. Earlier this year, the owners of her apartment complex sold the building. The new owner converted the apartments into condominiums. Belmer was given two options. Buy her apartment for $225,000, or move. "I feel like I've been pushed out of the way," Belmer said. "They do have senior apartments in the city, but the majority of them are not in that neighborhood." Belmer said she liked living in her apartment. She went for walks around the lakes and lived near grocery stores and shopping centers. Belmer didn't buy the condo. Instead, she moved to a different apartment in south Minneapolis. But she says she isn't happy she had to move. "We felt that they were getting rid of the poor and the older people and bringing in a new group," Belmer said. Housing advocates say thousands of people have been in the same position, as developers buy apartment complexes and convert them into condos. A report by HousingLink says 2,300 apartment units in Minneapolis have been converted to condos in the past five years. Christine Goepfert with the Housing Preservation Project says more than half of those units were considered affordable to people with low incomes. "The city has its goals and is working to its goals. But they're really just losing ground because of the condo conversion craze and the rate at which it's happening," Goepfert said. Goepfert says most of the condo conversions are happening in trendier parts of the city like Uptown. She worries that low-income people, defined as a family of four with an annual income of $39,000 or less, will be forced to move out of the city. Goepfert's organization says the city has to do more to protect affordable housing. It also wants laws in place to protect displaced tenants. 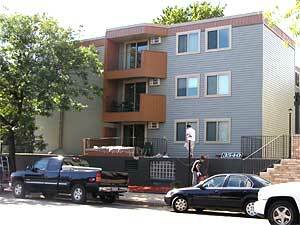 Condo conversions are one of the many affordable housing issues in Minneapolis. Mayoral candidate Peter McLaughlin says Mayor R.T. Rybak and his planning agency have to answer for the housing problems that are affecting low income people. "It is a serious issue, and it speaks to the lack of comprehensive vision for housing in the city of Minneapolis," McLaughlin said. "Our goal ought to be to provide housing across the full income spectrum in the city." McLaughlin doesn't support a moratorium on condo conversions, which has been suggested by several city council members and affordable housing advocates. Mayor Rybak also says a moratorium on condo conversions isn't needed. But Rybak says he's worried about the problem. Rybak says he believes the city can balance the demands of developers who want to build in the trendier parts of the city, with the needs of lower-income people who are looking for a less expensive place to live. "This land mass we call Minneapolis has room for more housing. I think it especially has room if we locate that housing along transit corridors," Rybak said. "If we continue to grow the amount of housing we have in the city, then it won't be this wrestling match between one group or another group trying to have housing." Rybak says condo conversions in certain parts of town, like north Minneapolis, can be a good thing. He says certain neighborhoods would welcome additional home ownership. Affordable housing advocates say they're also warning people who may be thinking about buying an apartment that's been converted to a condominium. They say potential buyers should do a thorough inspection of the unit and the building. They say many new buyers don't know that they are responsible for major repairs like a leaky roof or a broken furnace.